I ordered your product for both my cats and my dog in early March. 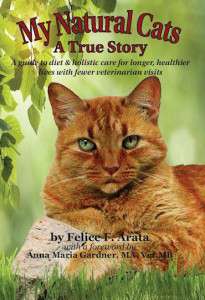 All three cats love the mixture made with chicken (they are less enthusiastic about ground meat) and switching them over to this new diet was absolutely no problem.They acted as though they had been eating this way for years! One big difference we noticed immediately was that one of the cats, who was a prodigious shedder, no longer sheds! As you can imagine, we’re delighted. My dog also loves to eat raw, but at 94 pounds he eats a lot more than all three cats combined, so my problem is not having the frig/freezer space to keep the amount of raw meat that he goes through every week. I’m thinking about buying a small freezer just for him!